Carnival Corporation & plc is a leading cruise ship operator and one of the largest vacation corporations worldwide. The company, which attracts around 10 million guests every year, is headquartered in Miami, USA, and London, England. It operates a fleet of approximately 100 ships under a number of different brand names. Carnival claims that at any given time there are around 277,000 people sailing aboard the Carnival fleet (200,000 guests and 77,000 shipboard employees). Its portfolio of brands include: Carnival Cruise Lines, Holland America Line, Princess Cruises and Seabourn in North America; P&O Cruises (UK), and Cunard in the United Kingdom; AIDA Cruises in Germany; Costa Cruises in Southern Europe; Iberocruceros in Spain; and P&O Cruises (Australia) in Australia. 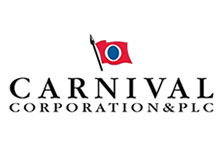 The company was founded in 1972 by Ted Arison under the name Carnival Cruise Lines and in 1993 it changed its name to Carnival Corporation. In April 2003 Carnival Corporation merged with P&O Princess Cruises plc and the result was the world’s largest cruise operator. Its stock is listed on both the London Stock Exchange and the New York Stock Exchange under the stock ticker symbol CCL.